For me, teaching is about two things: providing questions and the tools with which to examine those questions, and providing a space in which students can try, fail, and grow. Using Freirean problem-posing pedagogy, I focus on the issues and questions my students have about their world, and develop tools to help them find their own solutions. I strive to create learning spaces for my students that are equitable, accessible, multidisciplinary, and socially conscious. Read about some of my past and current course offerings below. Part media studies and part queer studies, this class examines the construction of queer images in popular culture. By analyzing the artifacts of pop culture (various media, ceremonies, politics, law, and more) students will discover the tools by which queer identities are shaped and presented to the world. Using these same tools, students will work to create new media and disrupt the production/representation/consumption of media to shift the dominant discourse on queerness. This course is designed to introduce students to issues in feminism through a postcolonial and transnational lens. Students will get an overview of concepts of gender identity, social construction of gender, the relationship between gender and politics and power, and more. Using an applied critical pedagogy approach, students will examine current social issues from various perspectives, analyzing structures of power and oppression, and creating their own next steps. I designed this course as an overview of theatre techniques, careers, and histories. Using a combination of applied projects, exercises, group work, and experiential learning, students have the opportunity to try their hand at acting, design, directing, and more. Crafted for non-majors, I focus on skills and experiences that open the imagination and can be applied to other disciplines. As instructor, I took the existing departmental model and integrated my areas of focus. I taught EL Fuchs’ Visit to a Small Planet, Guerrilla Design, Image Tracking, and other analytical techniques and led discussions and applied projects to develop analysis skills for production. 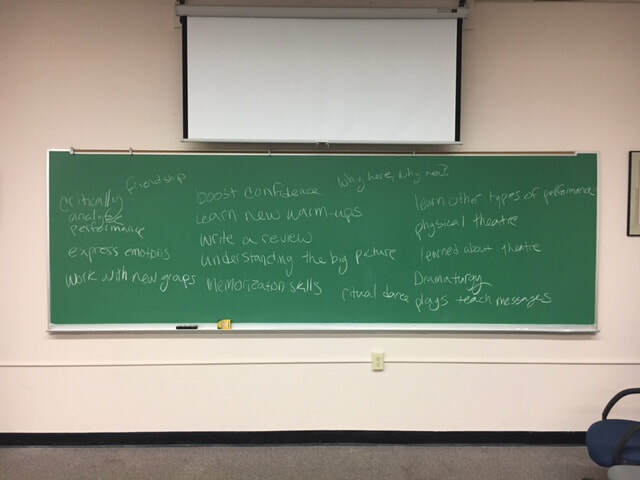 In designing this First Year Seminar I created critical and creative exercises to encourage analysis of queer performance, decode images and text, consider the possibility of queering performance. In this course I have combined media and technology with writing and group projects to create an experiential learning process. As instructor, I designed an online version of the course, focusing on the connection between various playwrights of color and major theatrical trends and aesthetics.